I believe no woman should be without the perfect red lipstick. If you find the right shade for you based on your skin tone, not only will it instantly make you look glamorous and sophisticated, but it'll do other wonders like brighten your complexion and of course, make your teeth look whiter. If you ever found that a red lippie didn't do either for you, you just haven't picked the right shade yet! 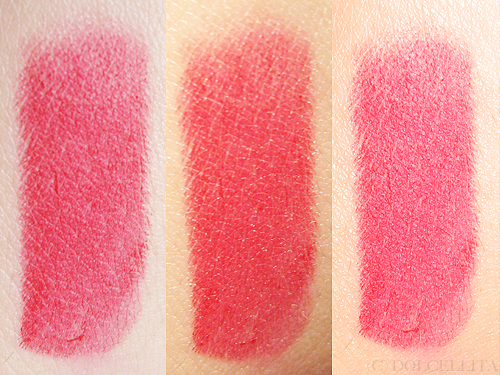 Check out this post from The Beauty Department.com to quickly find out what shade is best for you. 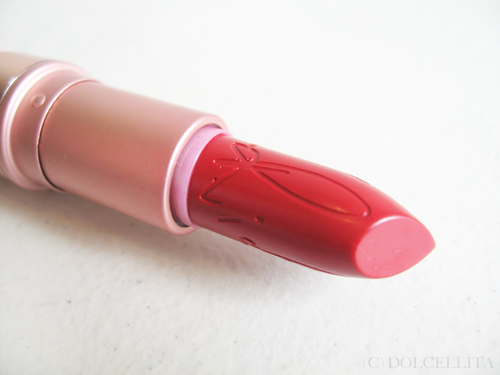 Speaking of red lipsticks, we all know that M·A·C's Riri Woo (Php1,100.00) quickly became one of the most coveted of all time, selling out within hours both online and in shops. Since I absolutely love sporting red lips, no matter the time of day, I knew I had to have it as well. The classic Ruby Woo is already one of my many favorites from all of M·A·C's lipsticks, and even if it's difficult to tell them apart, the subtle differences (slightly darker with a different undertone) enticed me enough. I always make sure to get at least a couple of items from any new collection anyway! Haha. 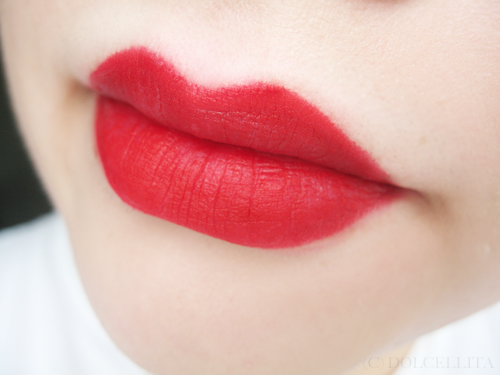 This gorgeous lippie is described as a "matte cool red [with a retro matte finish]". This is just one of those shades that'll suit a lot of skin tones, from fair girls like me to those with more warmer complexions, which is probably an added reason why it was so in demand. The packaging is to die for. I'm not the biggest fan of Rihanna herself, just her music (if that makes sense), but you can't deny the tube is absolutely gorgeous. Everything from the golden finish, to the cute 'hand writing', and the whole color scheme. 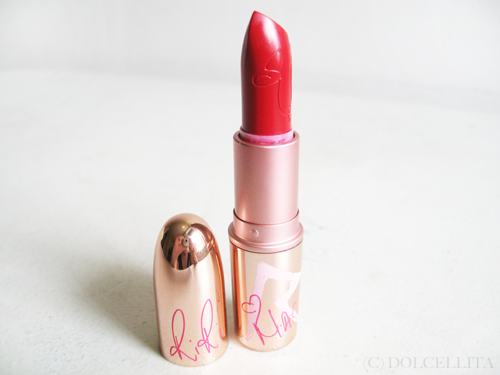 The lippie itself is equally gorgeous, and seeing Rihanna's signature etched onto the product almost made me unsure if I wanted to start using the lipstick already or not. Since this is a true matte formula, I don't really need to wear a lipliner with this because it doesn't bleed at all. However, I like to go over my lips completely with one anyway to act as a 'base' for the lipstick itself and when I want to define my lip shape a little more. Also, because it's matte, this does tug a little on the lips when applying but some lip balm beforehand will help a lot, especially if you have naturally dry lips like I do. The wear time of this lippie is, of course, amazing. I can get about 6-8 hours of wear before it starts to fade, and even then it's only minimal so there's no urgent need for me to retouch. It helps that the formula stains the lips a little too. RiRi Woo also pulls through those hours with meals and snacking in between! I haven't tried this while eating oily food though, so I'm not sure how it'll hold up because my regular lipsticks and some of my matte ones practically dissolve once they come into contact with oil. But, I have read some reviews that say this lipstick still manages to pull through despite. I'll have to put that to the test soon! When this does start to fade, I find that it fades from the center which I prefer, rather than have it fading around the sides because it makes retouching easier and any disappearing color isn't as obvious (again, the staining helps). Like Ruby Woo, and a lot of other matte lipsticks, this does feel drying on the lips, especially the longer you wear it. You can always opt to put a gloss on top, but just remember that it'll shorten the wear time. I always prefer keeping mine matte. Lastly, I wouldn't say this 100% transfer proof as even after a few hours of wear it still manages to transfer, but it does so minimally as well which is good enough for me. I tend to forget to or am too lazy to blot after applying though so maybe that's why it still transfers, haha. Overall I love, love, love this lipstick and am only disappointed that it's limited edition because I'd love to purchase it over and over again. I guess there's always good ol' Ruby Woo to turn to! Highly opaque. Full coverage can be achieved in 1-2 swipes. Long wear time (around 6-8 hours). Brightens my complexion and makes my teeth look whiter. Stains the lips a little. Lip liner not strictly necessary. Makes my lips feel really dry after a few hours, but this is the case for a lot of matte lipsticks anyway.